Conservative patriot Dave Agema still on the list. Michigan’s Dave Agema referenced the ‘list’ during a recent appearance in Troy, MI. As the ‘religion of peace’ radical islam inserts itself into American culture as accepted and promoted, perhaps it would be good to ask folks if they believe that there is any compatibility of liberty with sharia law? Perhaps even our liberal friends might consider the personal danger posed to their beloved homosexual activists? Arguably, as seen in European nations where islamic resettlement has happened, it may only be recognized when it is too late. Agema and many others who are on the list have been up front in their belief that sharia is not only incompatible, but is dangerous to our way of life. An open letter to Amazon.com Owner Jeff Bezos on the Main Street Tyranny tax. Regulars have seen the attempts here to correct the misinformation about the main street fairness act. I am an online retailer. I have been fighting the mainstreet fairness taxes for several years now. Recently, Michigan legislators in a lame-duck session voted to address nexus issues in the state in an attempt to collect use taxes from out of state vendors such as Amazon and other drop shippers. Clearly you have been arguing that the commerce clause is the remedy to what the states are trying, and frankly you are right. Quill v North Dakota settled the matter, and if there was EVER a reason for Article 1, Section 8, Clause 3, this is it. The states cannot use tariffs or taxes to discourage (or encourage) trade with other states. It is one of the enumerated powers of the congress, and the states have little business attempting to work around it. Michigan can learn a lesson from the new schoolyard bully; The homosexual activist who gains power. One has to wonder about the mental defect in those who support a change to the Elliot Larsen Civil Rights Act when looking at the evidence before us. There is little that is protected more than the right to free speech, and by extension the right to proselytize, preach, minister or practice one’s faith as shown in this nation’s constitution. There is a reason it was numeral UNO insofar as clarifying amendments go. The mayor of Houston is off the hook tyrannical, and should not only be removed from office but sanctioned for attempting to subvert the constitution and abuse her elected position of trust. There MUST be consequences for such actions, or we will continue to see more of it. And Michigan is under the threat of the same type of abuse, as behavioral quantification is used to qualify ‘protected’ classes of people. Any legislator who opens up the door further to this type of terrorism on individual, business owners or (as we see in Houston) our spiritual leaders, needs to be run out on a rail. We’re laying the track right now. Nothing new, but always disappointing. The left has no tolerance for the suffering, unless THEY too are a part of the intolerant left. Battling cancer ends the right to free speech apparently. 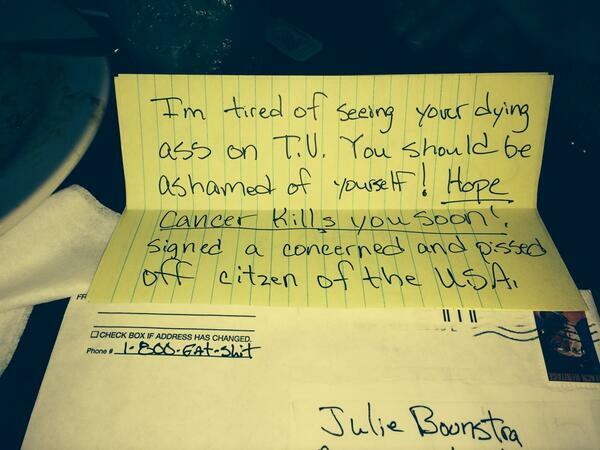 Julie Boonstra’s effort to let folks know how badly Obamacare has affected HER has simply made her a target for those who present themselves as champions of compassion.